I have uploaded a new video tutorial that discusses how to acquire a large tractor tire to be used for flipping and a variety of other exercises. A few sample movements are also demonstrated (beginning at approximately 3:23). Something to mention is that if you live in a warm climate old tires with water in them are perfect breeding grounds for mosquito larvae (in the southern USA particularly the Asian tiger mosquito). To avoid the health risk and annoyance these insects pose you need to either cover the tire or drill some drain holes through the rubber. Pingback: 04/08/11 – Now, I know you don’t like to run, but it’s Friday, you ain’t got no job, and you ain’t got s#*t to do! I have two tires. Both much smaller than Ross’s. Probably a quarter the size and a half the size. I use them for sledgehammer strikes but I also love to drag them. I drag the larger one for time and I do sprints with the smaller tire. Both provides very hard workouts. When dragging, it isn’t the weight but rather the resistance along the ground. I usually combine tornado ball slam on the wall, sledgehammering and the last exercise you showed, 10 rounds, 1 min each with 10 second rest. My mistake is I had giant tyres ( more than half a ton each) and nobody seems to be able to flip them. I have 3 tires now. The largest weighs 526# and the 2 smaller ones are between 250# and 300# each. They’re the best things I’ve ever gotten to train with, PERIOD. Doing flips with my heaviest tire for total flips over time ramps my metabolism up like nothing else! The best part… ALL 3 WERE FREE!!! I plan on stopping by one of the two industrial tire shops I know for an even heavier one once the weather breaks here. I have had my tire for 2 years now and it is the best piece of equiptment I have in my home gym. Did the same thing as Ross and got it from a tire shop for free. 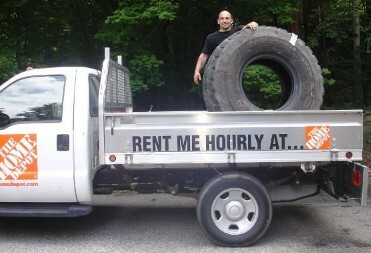 Tire shops and landfills both give them away for free. Interesting, Anthony – dragging a tractor tyre is never easy. How do you do that? It’s very heavy. Great advice for how to find these massive things. I think it’s cool how the tire gets a second life and stays out of a landfill or processing plant. Thanks for posting. Here are some more ideas for tire training. Bore two sets of holes in the side wall of the tire, then using pipe, chain, d-rings, and eye bolts you can make a set of handles for the tire. With the handles you can stand in the middle of the tire and do deadlifts, shrugs, and farmers carries. Depending on the weight of the tire you may want to bore holes through both sides of the tire to give the chains a little extra meat to hold onto. Also you can bore two holes on the tread and using a longer pipe, chain, d-rings, and eye bolts you can make a bar to do some rows and tire drags. Stand facing the tire, squat down a little, and pull the tire toward you. I just got a massive crane tyre from the tyre place its a lot bigger than the tractor ones , does it matter what size the tyre is for hitting with a sledgehammer? is more give in the tyre better or less give better? I read somewhere that a harder impact when you hit the tyre is better for you . Is this true , and will it make much difference , as you are hitting the tyre the same amount of force – if it gives a little or if it don’t? Can someone give me an idea of the weight of a specific tire . Ive found a shop that has a bunch of used ones but I have no idea which would be best to grab. Hey, I live in Austin, tx and I wa wondering if someone knew where to get a tire here.. I’m having a hard time trying to find one, so if anyone knows please do tell.. I have been trying to acquire one or two large 300lb tires for my High School Rugby team with no joy. I have even had friends in the logistics business trying to source out for me. I live in New York city if anyone knows who or how I can get hold of one, please let me know. I got my tractor tire from a company that sells them. Had a big stack. they thought I was nuts strapping on top of my vw (made the springs sag). drove to the self car wash to clean it off. flip it, pound it, hop into it, onto it, rest feet on it for push ups, farmer carry it. Fun, fun fun. Me and my friend are going to start doing some of this kind of conditioning work so sourcing a tyre now. Great video. I want to share this. I also wonder if Mikka ever found a tire in Austin. That’s where I’m located and I’m about to begin the search myself. This is great advice. We get some people asking us for tips on where to find tires and this is what I’ll start telling people. The home depot truck is a smart idea too versus uhaul is likely a bit more of a hassle to get a decent truck and one that’s wide enough to handle a tire.